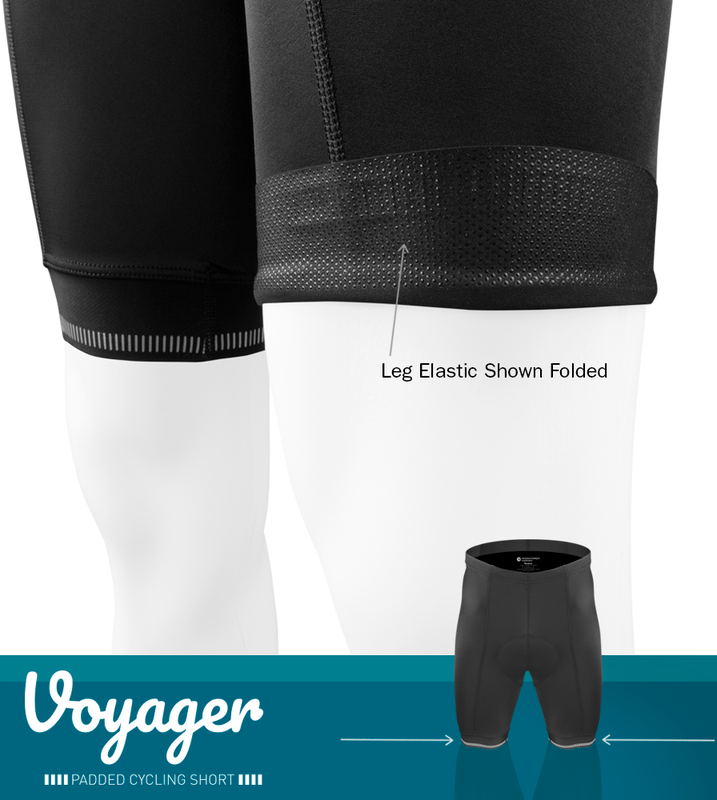 The Voyager cycling short - A bicyclist's dream short has come true. Stay comfortable on your bike all day. Looks like a regular bike short. The fabric on this high end short is luxurious, soft and compressive. These shorts disappear when you put them on. These fully loaded shorts that are soon to be your favorites, because you will have all the features needed for cycling comfort. This Voyager bike short has a back pocket that is easy to reach and holds a host of items, big enough for water bottle, cell phone, keys, cash and snacks. The back has a 3M Scotch-light reflective tab that bounces light back to it's source at a luminosity that is unparalleled in any other reflective material. Low light conditions in the morning or evening can be enhanced for visibility to motorists. This garment has 360 degrees of active visibility. The placement of the reflectives are key for brilliant lighted back-end and moving legs. This makes your visibility maximized if you get caught out late. CAUTION - NO DRYER USE AS THE HEAT WILL DELAMINATE THE ADHESIVE HOLDING THE REFLECTIVE IN PLACE! Washing Instructions: Machine wash gentle, air dry. The legs have an Italian printed silicone gripper finish that feels nearly invisible. The legs length is on the long side, so amazingly comfortable because of the light compression and nearly invisible feeling next to the skin. The added bonus is the reflective laminated to the leg hems, located on a moving part of the body so the visibility of light bounced back to the source is active and moving. A fabric that is: 76% Nylon 24% Spandex provides the ideal amount of compression for muscle support and massage during exercise. The spandex provides a massaging compression to help work out lactic acid buildup during rigorous cycling. The compression enhances blood flow to the muscles to help support high performance. To learn more about compression and it's benefit during exercise, google the topic and learn more. All Day Chamois pad is new, it is scientifically engineered for long distance cycling which more than 6 hours of riding. The All Day Chamois padding is a com The All Day chamois pad is multi layered with dual density foams. The foams are laminated and lazer cut to create thick and thin padding that maximizes the comfort with thick and thin padding. An Italian engineered crotch pad that is a combination of technically advanced 3D foams that are combined to create a zero friction environment for cycling.The 4 layer all chamois pad is a high end performance pad designed to give cyclists an all round long lasting comfort for rides over 6 hours long. Dual density foam means there are two types of foams combined together and then scythed or "lazer cut" into an engineered pattern. The vibration and shocks of cycling are then absorbed by a spot of high impact foam layer directly on the saddle side. This layer is covered with a softer, medium impact foam on the side of the body. Both foams are highly elastic and stretchable for great fitting into the curves of the crotch areas. The elasticity of the combination of components create an ergonomic quality that fits perfectly. The perforations within the foams create airflow for coolness. The fabric has carbon yarns that are bacteriologic which means they prevent bacterial from forming thus preventing saddle sores. The carbon creates an antibacterial effect to eliminate risk of infection. The fabric face is a polyester knitted jersey that stays dry through a wicking action that pulls perspiration away from the skin into the perforations of the foam for migration to the surface for evaporation. This is a surprisingly agile short. The pad is excellent and the reflectives are brilliant. Love them! !